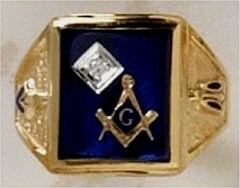 Scottish Rite/York Rite/Shrine Ring 10KT Gold. 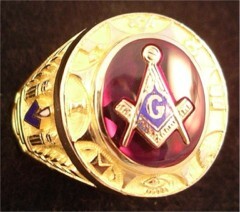 If you are a Mason belonging to the Scottish Rite, York Rite and Shrine, this is the ring for all of those organizations. You now have the option of adding the Royal Order of Jesters Bilikin to your ring. 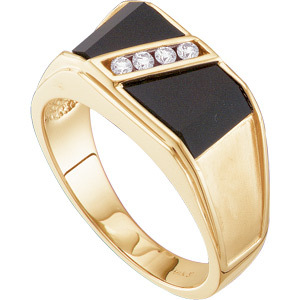 In my opinion, this is the cadillac of band style rings. The band is approximately 9.5mm wide and a man's size 10 weighs in at approximately 10.5 grams. It has nice weight and is extremely comfortable to wear. 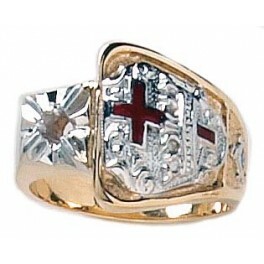 The stock ring comes with the following emblems: Scottish Rite, Shrine, Keystone,Blue Lodge, Knight Templar, 14th Degree,18 Degree Rose Croix. The ROJ Bilikin is also available as well as others. The emblems shown on the picture are an example if the emblems that are available on the ring. 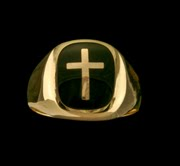 You can have your choice of up to 7 emblems put on this ring. 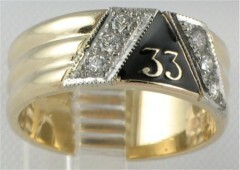 If the ring is a size 12 or larger, an additional emblem can be ordered at an additional cost of $35.00. Your choices are: Scottish Rite, Shrine, Keystone,Blue Lodge, Knight Templar, cable tow, 14th Degree, 18 Degree Rose Croix, Past Master, 16th Degree, Royal Arch Mason, Red Cross, Plumb, Trowel,Council, Eastern Star, Knights of Malta and the old English letter "Q". There is an area on the back of the ring that will allow you to have the ring re-sized in the event your weight changes. It is a beautiful rings made by a high quality jewelry manufacturer. It is heavier than most band style rings made by our competitors. Expect to pay much more when purchasing this ring from a quality jewelry store!